Martin McDonagh made his name 15 years ago with this pitch-black Olivier-nominated comedy, set in the Galway mountains where the Camberwell-born McDonagh spent his holidays. Joe Hill-Gibbins’s revival returns with a couple of cast changes after a hit run at the Young Vic last year. Moonlight and lyricism are in the bedrock of the language, but, in a poky cottage curtained by falling rain, McDonagh’s pre-boom portrait of an ageing mother and daughter rips apart the lilting mythography that tends to veil the dark side of rural life in the Emerald Isle. Most people sympathise with the daughter, Maureen, a 40-year-old virgin measuring out her life with spoons of Complan and porridge which she resentfully prepares for her ageing mother. Actress Derbhle Crotty makes Maureen attractive – she bristles with a manic warmth that is funny and increasingly desperate. But it’s her scheming old mother Mag (the wonderful Rosaleen Linehan) who gets my vote – rocking back and forth like the old lady in folk classic ‘The Spinning Wheel’. The song is a cosier take on this age-old situation: a virgin trying to escape a surveilling older woman in order to get laid. When Delia Murphy’s cover of the song quavers over the wireless into Mag and Maureen’s kitchen, it brings deep irony as well as genuine feeling. Linehan’s Mag is an awful old toad, wheedling for tea and sympathy and nimbly hopping about to interfere with her daughter’s love life as soon her back is turned. But she is even more vulnerable than her desperate daughter – and nobody is willing to give her the tender loving care that she milks so artfully from the unwilling Maureen. Frank Laverty is nicely straightforward and sweet as Pato Dooley, the local man who might just be Maureen’s one-way ticket to sexual fulfilment and America. 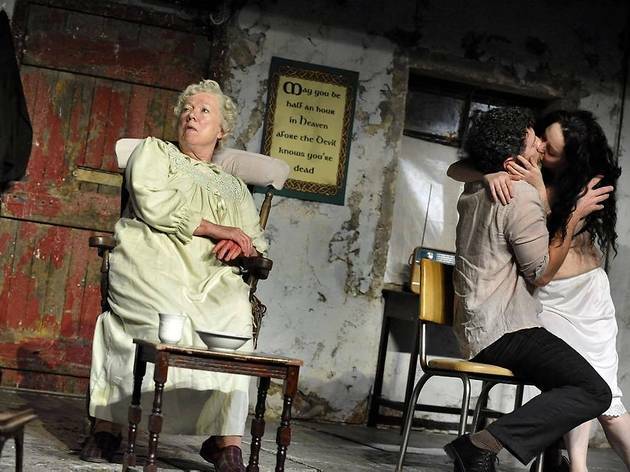 McDonagh’s Leenane plays were part of a new movement in Irish theatre, which made great theatrical use of the unchanging rituals of life in parts of Ireland whose loveliness makes them a lodestone for nostalgic expats and hell on green earth for some of the inmates. 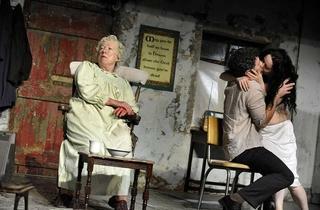 McDonagh’s critics object to his taste for pastiche and his cruelty to his characters. But this drama, the first in his Leenane Trilogy, is more than a piece of well-written opportunism: it tickles you into a twee sense of comic security then hits you over the head with the realisation that the plight of the people you were laughing at isn’t funny at all.